Village Green RN Donna Chandu-Lall, pictured above, has been hosting activities focused on infection control this week that are both fun and educational. Oct. 15-19 is National Infection Control Week this year, and Donna has spent the week organizing activities that educate staff members about the importance of hand hygiene in combating infection risk. But the ideas she has been using are not just educational, they’re also fun. In one activity, staff members used Glo Germ, a solution that’s rubbed on hands. People then wash their hands as best they can to remove the solution and then hold their hands under ultraviolet light. Glowing spots, which are supposed to replicate bacteria, indicate areas where the solution remains. The purpose of this exercise is to demonstrate how easily bacteria can remain on hands, even after thorough cleaning. Another activity focused on team members knowing what personal protective equipment to wear in the event of specific events to minimize the risk of infection. Donna says having fun exercises for team members to practise good infection-control habits helps embed knowledge. “I think it gets the point across much better; they still have to think about what they are doing, but I try to make it as fun of an activity as I can think of,” she says. 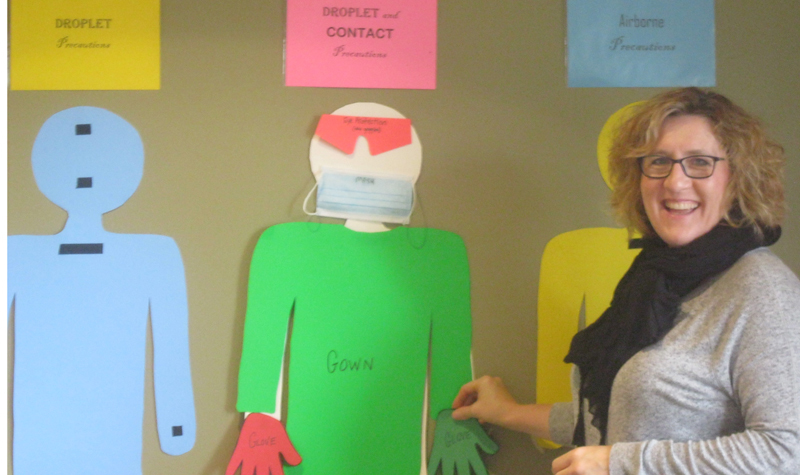 Donna, Village Green’s infection-control team lead, says she uses both original ideas and suggestions for activities from Public Health Ontario which she then modifies to suit Village Green’s needs. For the past three years, Village Green has been hosting events during National Infection Control Week organized by Donna. Acknowledged every October throughout Canada the U.S. since 1988, National Infection Control Week aims to promote infection control education to staff members in long-term care homes and hospitals.